Online video streaming is starting to heat up with Google’s new Chromecast. This $35 HDMI dongle is taking online streaming to the next level with the ability to enhance any regular HDTV into a smart TV with instant streaming and option to use any iPhone, Android phone or tablet as a remote. The device was sold out for weeks after its launch and is still on back order with many anxious people waiting to test out the functionality. What does Chromecast have to offer? Chromecast is fairly simple and not difficult to understand, it is basically a small Andorid computer/stick that connects to the Internet and plays video files; the video content streams from your Internet, not your device. One thing you need to consider when you’re looking to purchase the Chromecast, is that you need a solid Wi-Fi signal or you may end up throwing the dongle to the dog when the audio and video skips. 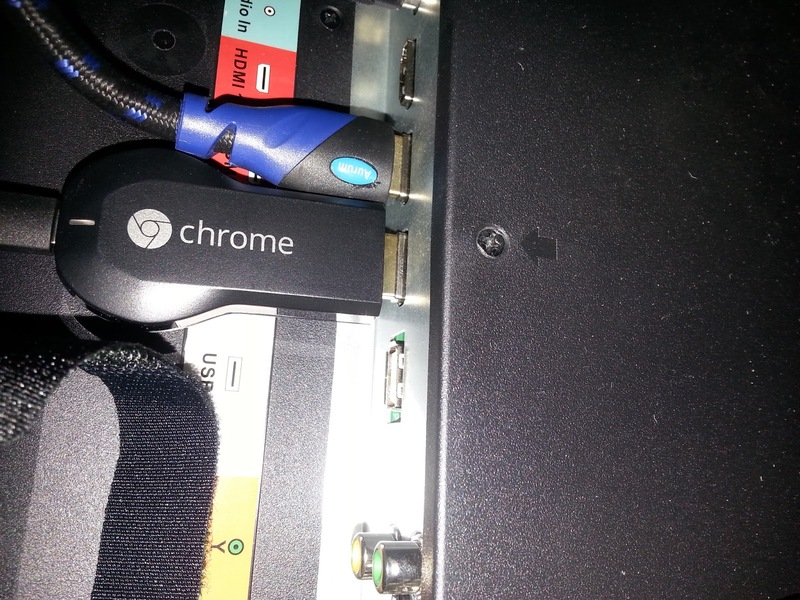 As of now, this device supports Netflix, YouTube, and Pandora and also provides the ability to enable a backdoor to many other services by building in support for displaying Chrome tabs on the connected TV. This functionality treats the TV as an extension of the browser which allows you to stream the majority of streaming videos available online. In order to do so, you must use the Chrome web browser in which enabled webpages display a Cast button to extends the video to your connected TV. Our internal testing has proven the web browsing experience to hold a 2 second delay on a wireless N network. Additionally in-browser video suffers from syncing problems between the audio and video. Netflix and direct video Casts work smoothly. What’s up with its competition, Roku 3? Besides the fact that Roku 3 is $100, the two devices have similar features and functionality but each lack a few main characteristics. As of now, Roku 3 offers more channels but lacks in offering a fully functional browser or tablet integration. Roku 3 offers over 800 channels but excludes one of the most common video sites, YouTube. Now don’t get me wrong, Roku 3 does have an Android and iPad app but lacks features and seems to only automate the interface but does not enable screen mirroring. Roku does have Plex capabilities, which allow you to stream over the air from your laptop or other devices, which Chromecast does not yet have. Chromecast doesn’t have a dedicated remote, instead you would have to have each application on your phone or tablet and with the click of an icon it displays onto your TV. Roku comes with a dedicated remote but also has Android and iOS remote apps available so you can do away with the remote after you set up the device. If you’re someone who often watches videos and shows on a laptop and looking for an easier way to do so, the Chromecast could be the right thing for you. While it is limited and a bit choppy right now, I’m convinced its low selling price and open SDK will drive lots of future native major video streaming functionality. Although it relies strictly on mobile devices and tablets to operate it, the majority of people that would buy the Chromecast would already own one of these types of devices. On the other side of things. if you already have other devices that support streaming video (PS3, Wi-Fi enabled Blu-Ray, smart TV) there’s not much point to purchasing this device unless you just want to test it out or use it for travel. Given the price of this device, it’s really hard not to consider purchasing the dongle (and dongle is a fun word).